. . . and babies make four. : And the answer is . . .
First, a huge thank you for taking the time to ask really great questions! I've loved the mix of serious questions -- that have made me think -- and the just-plain-fun questions. I've tried to provide complete answers -- probably too complete in some instances -- and I haven't purposefully skipped any questions. The answers aren't in any particular order but I have eliminated duplicates. Also, I've broken up my answers so the post doesn't get too long. Here are the first 20 answers . . . And feel free to still ask questions through July 9. There’s not much I won’t celebrate but I absolutely love Christmas. It’s a great time of year around our house too since in six days’ time we have Christmas and three birthdays – mine and the girls. 2. Are you an animal person? Do you think you'll ever have any pets? Eric and I both like dogs and Michal loves dogs. (She’ll tell you, “I LOVE dogs!” if you ask her.) Kenna is a little scared of dogs but says she likes them too. Michal desperately wants a Papillion because of the book “Fancy Nancy and the Posh Puppy.” I don’t think we’ll be getting a Papillion though . . . I gave Eric a puppy -- an American Eskimo -- for his 21st birthday and she was our “only child” for 17 ½ years. I am sure that some day we’ll let the girls have a dog but not any time soon. 3. Have you considered Chinese lessons for your family? And what other ways, if any, do you embrace the girls culture and heritage? We live in a small town and are having a difficult time exposing our daughter to hers. We are very fortunate to live in a large metropolitan area with lots of cultural resources. We regularly visit Chinatown, celebrate the major Chinese holidays and have lots of Chinese performing artists, festivals and exhibits in the area. And yes, we have considered Chinese lessons for our girls. They really want to learn Spanish though! They are going to start taking Chinese dance lessons this fall, which I think is a neat way to introduce a little of both the language and the culture to them. Since you live in a small town, and probably don't have many Chinese events, you may want to consider celebrating a couple of the Chinese holidays – like Chinese New Year and the Moon festival – with your friends, neighbors and family. It would be a fun way for your friends and family to learn more about the holidays and for you to introduce those holidays to your daughter as well. I personally don’t think it matters if the celebration is big or little, involves lots of the customs or just a couple. I think it just matters that you do something. We also love the books by Grace Lin – “Round is a Mooncake,” “Dim Sum for Everyone” and the others she’s written. I think they’re such a fun way to introduce things that are uniquely Chinese, like dim sum and mooncakes, from a Chinese-American perspective. 4. How did you decide on China and why? Choosing to adopt from China was a fairly simple decision. We honestly never talked about domestic adoption or adopting from other countries. We have good friends with a daughter from China, whom we adore, and Eric and I both really like Asia and had traveled in several parts of Asia, although not China, before starting the adoption process. We knew the process was straightforward and not wrought with corruption, like sadly many international programs are. We also knew that the children in Chinese social welfare institutes are well cared for and usually available for adoption at a relatively young age. 5. Do you have a degree in design or art? Did you take photography classes? I don’t have a degree in art (my degree is in English) although and I’ve never taken a photography class. I've always been artistic though and have dabbled in one "artsy" thing or another as long as I can remember. I really enjoy photography and am working at getting better. I’m signed up for a class later this summer and can’t wait! 6. I was wondering if the twins are starting to ask for a "sibling" or if -because they have each other- they don't ask. 7. Next year when the girls begin kindergarten will they attend a public or private school and do you plan to have the girls in the same or separate classes? The girls actually don’t start Kindergarten until 2009 so they are registered for preschool for this fall. They will be in the same preschool class. I go back and forth on putting them in the same or separate classes. There are volumes of research that support placing twins together and volumes that support separating them. The only consistent recommendation seems to be that it should be the parents', not the school's, choice. Next year we’re going to try a couple separate activities and see how it goes. I know for some twins being separated creates terrible anxiety. I don’t think that would be the case for us but they’ve never been separated so we’ll see. 8. When shopping for yourself, what is your favorite store? I love Anthropologie! I could spend hours in there looking at clothes and home things and the incredible ways they’ve displayed it all. I also really like J. Crew. 9. I read on another China Twin Blog that their girls talked to each other in Chinese when they first brought them home. Did Michal and Kenna do that? Really great question! If they did speak Cantonese to one another I certainly never heard it. 10. Are Kenna & Michal identical twins? Are their personalities a lot alike? Michal and Kenna are identical twins. They like many of the same things, choose to play together literally every minute of every day and have even developed their own, made-up vocabulary. They do however have fairly different, yet very complementary, personalities. 11. I'm curious to know if you've discussed their adoption with them and what their reaction was. What kinds of questions did they ask? We have told them the story of being born in China, living with a bunch of other babies -- some of whom they know -- and then us coming to China to adopt them for as long as I can remember. They’ve always known that we adopted them so there’s never been a “moment” where they were told. We’ve haven’t discussed birth parents yet and although they know they had a nanny to take care of them in China, they certainly don’t understand the concept of a social welfare institute or why they lived there. I loved that she had taken what I’ve told her – “Mommy and Daddy adopted you and promised to love you and be your Mommy and Daddy forever . . . “ – and applied it appropriately. At this point though they haven’t asked many questions. I’m sure they will though. 12. My question is about their names. They are such unique names, were they family names? Eric and I heard the name Michal (pronounced McCall) about 15 years ago. The original Michal was someone who worked for Eric. We both just loved her name. Through the years our opinions about many things have changed but we’ve never wavered on the name Michal. Michal’s middle name is Aline, which is my mom’s middle name, and my maternal great grandmother’s first name. When we found out it was twins we didn’t have a second name chosen and there was no list of "other" names that we'd considered. Kenna was actually Kate for about a week before we made a final decision. 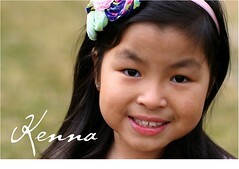 Kenna is Eric’s step grandmother’s name. I just loved the name and especially liked that it’s a feminized-version of a boy’s name just like Michal is. The two names just seemed to go together. Kenna’s middle name is Elise after my maternal grandmother, Ella Louise. 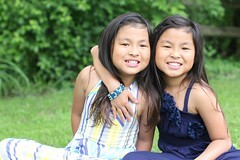 Both girls also have their Chinese names – Ying Chun and Ying Jie -- as part of their middle names. Their Chinese names actually mean the same thing and are two characters that are usually not separated. So they were chosen for them because they are twins. 13. Based on their interests and personalities, what do you think they will be when they grow up? Michal is emphatic that she wants to be a teacher. She tells me – often – that she “would like to teach some people something they don’t know.” Oh, and she wants to teach at a "big girl school. It's not a boy school just a girl school." She’s been saying this for a while now. Kenna wants to be a pilot. They let her “fly the plane” one time when we were getting on a Southwest Airlines flight and that sealed the deal for her. And I can actually imagine her being pilot. She is very focused, analytical and has an amazing memory. I can also see her teaching or working with people in some way. 14. How do you tell the girls apart? I know that for you this must be a very obvious question, but I can't tell them apart unless you point out who is who. I certainly can tell that they have the same features but they don’t look alike to me, if that makes any sense. It probably helped that they really didn’t look alike when we first met them – Michal was bigger and her hair had been shaved much shorter -- and then after a short time they no longer looked alike because we knew their personalities. If they are standing next to each you can sometimes tell who is who because Michal is a smidge taller. This isn’t always helpful though if one is slouching, standing on her tippy toes, is up on a rock or a stair or has even slightly puffy hair. The other way to tell is to look at their face shape. Kenna’s face is a perfect circle. 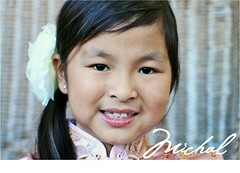 Michal’s face is also round but she has just a slightly higher forehead that gives her face an oval shape at the top. First, thank you. That's a really nice compliment. I do have someone who cleans our house once per week and during the summer I have a college student who comes for a few hours a couple times per week so I can run errands or go to the gym without the girls, and so Eric and I can go out on a "date." The best help I have though comes from Eric. He is very hands-on and helps with the girls a lot when he’s at home. He gets them in their pjs at night and he reads them books before I put them to bed. He is also very sensitive and often will tell me to go take a couple hours and get a pedicure or go out to dinner while he’s with the girls so I can have a break. 16. Why did you request twins? 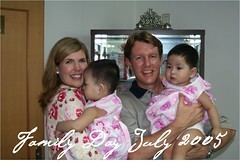 We hoped, when deciding to adopt a child from China, that we could offer them security, stability and a family to love them. 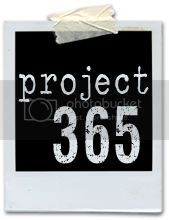 One of the things we knew that we most likely would not be able to give them would be the opportunity to meet a birth parent or biological relative. We thought it would be really special to have twins who would always share, not only their DNA, but their history. We thought it also would help answer the “Who do I look like?” questions most people who were adopted have. 17. Are you a Macy's or a Field's fan? Marshall Field’s, without question. There was a stately elegance to everything Marshall Field’s that just doesn’t exist with Macy’s. And I think it's disappointing they didn't keep the Marshall Field's name on the downtown location . . . so much history there. 19. Where did you grow up? I grew up in Arizona and went to college in California. 20. When, if ever, would you like to return to China with the girls? We will absolutely return to China with the girls. My hope is that we’ll be able to do a heritage tour with some of the families in our original travel group. My guess is that we’ll go when they’re somewhere between 10 and 12. I’d love to go sooner but I want them to be old enough to remember and appreciate the experience.